What is NuHair Hair Rejuvenation Regrowth Tablets? In this review, you may read all about a hair growth product called NuHair Hair Rejuvenation Regrowth Tablets. This product is designed to curb the symptoms of hair loss in men, and seeks to increase the speed at which hair grows, and to ensure that the new hair is significantly stronger than its predecessor. NuHair Hair Rejuvenation Regrowth Tablets claims to block the primary cause of male pattern baldness, by preventing the production of high amounts of DHT, a form of testosterone which is directly related to the hair loss phenomenon. To find out more about the ingredients, advantages and shortcomings of NuHair Hair Rejuvenation Regrowth Tablets, make sure to read through our full review. 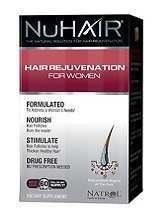 NuHair Hair Rejuvenation Regrowth Tablets has a pretty complex and unique formula among hair growth supplements. It contains a wide variety of plant extracts to ensure that the hair follicles get the boost they need to strengthen the individual strands of hair. With these ingredients, this supplement allegedly increases the speed at which your hair grows, so not only does it prevent further hair loss from occurring, it also helps repair the damage done much quicker. The various minerals also improve general hair health, and the skin and nails also see much benefit from these substances, making this rather versatile product – on paper. Based on the manufacturer’s recommendations, the suggested daily dosage of NuHair Hair Rejuvenation Regrowth Tablets is two pills per day for adults. To achieve maximum effect, you should take one in the morning, and the other at night, with your breakfast and dinner meals. The consumption of food activates the digestive system, ensuring maximum absorption. One package of NuHair Hair Rejuvenation Regrowth Tablets, containing 60 pills, which is supply enough for one month of regular usage costs a massive $38.49 when purchased from the manufacturer’s website. If we compare this product with the competition, we see that it is obscenely overpriced. Certain ingredients may trigger allergic reactions. It’s recommended to speak with a doctor before adding any sort of supplement to your regimen. There is neither any guarantee info nor customer reviews present on the website. While NuHair Hair Rejuvenation Regrowth Tablets has a unique and complex formula, the long time needed for results to show, the extremely high price and the lack of a guarantee forces us to urge caution against this product.